May. 24, 2013 7:00 a.m. 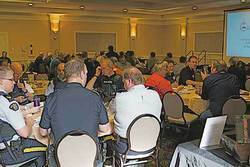 Emergency responders from several different municipalities packed the ballroom at the Executive Royal Inn to work through a plane crash scenario hosted by Leduc County. As part of Emergency Preparedness Week Leduc County recently hosted an exercise designed to test how our emergency services personnel would respond in the event of a large scale emergency. The hypothetical scenario was a commercial plane crash that occurred on 10th Ave. and Sparrow Drive in Nisku also involving the railroad crossing there. Bob Galloway, the County's Director of Emergency Panning and also the former Fire Chief of Leduc County, put together this training exercise. Held in the ballroom of the Executive Royal Inn (basically the location of the "crash") the room was packed with uniforms representing every sector of our emergency services first responders. Firefighters, RCMP, Peace Officers, and EMT's from not just Leduc and county but from Strathcona, Spruce Grove, St. Albert, and Sturgeon County were on hand to learn and contribute for the day. As each participant signed in they received a thick booklet detailing all of the things that would occur during this hypothetical crash, and a video screen was set up at the front of the room to keep everything and everyone on track as the "emergency" would be run through in real time. Beginning with the crash of a Boeing 727 carrying a crew of three and a cargo of drilling equipment, the plane comes in a mile short of the runway first hitting a drilling rig in an industrial yard in Nisku, then impacting a large office/shop, slamming into rail cars travelling south from Edmonton, and finally crashing onto Hwy 2 and breaking apart. Each element of the crash was laid out in detail with responses coming fast and furious from the emergency crews as the different scenarios were presented. Each element of the crash was assigned a time of occurrence which told everyone exactly how long they had between every stage of the crash. All of the resulting emergencies created by the original crash also had to be dealt with, such as the multiple injuries at different sites from the things the plane had hit as it was coming down, organizing an emergency stop of the rail lines so no new trains came chugging down the tracks to add to the crash, and the multiple car crashes and eventual traffic jam on Hwy 2. The effects of social media was even considered as first responders recognize that Twitter and Facebook would be going crazy with photos and reports of what was occurring at the crash site. Many procedural questions were posed such as who was responsible for making contact with various organizations such as the airline involved in the crash, what are the fire officer's priorities and what resources would be needed to accomplish them, and how would a no-fly zone be enforced over the crash site, to name just a few. Despite the unbelievable amount of concurrent emergencies presented and seemingly insanely tight timelines given, everything was dealt with throughout the morning in a calm and professional manner but there was no denying the underlying tension in the room as each one of these highly trained people were well aware that, for the moment, this was just a hypothetical exercise but the possibility of it becoming very real, very fast is all too great to deny. The exercise ran very close to its real time objective with many questions receiving their answers along the way and the different emergency responders leaving with very clear objectives for their duties and roles should a large scale emergency ever take place in Leduc County. An interesting definition of an EOC (Emergency Operations Center) was included in the handout, and after reading it one couldn't help but think of the extraordinary type of person it takes to tackle this type of job. It read; "Where uncomfortable officials meet in unaccustomed surroundings to play unfamiliar roles, making unpopular decisions based on inadequate information in much too little time." Not exactly what most people would call an enticing job description! Thank heavens our emergency responders view this type of scenario as their calling, and see the value in taking the time to put on and participate in important workshops like this in order to keep the rest of us safe.